There’s been so much talk about branding especially Employer and Employee Branding including Individual Branding. We’ve even spoken quite a lot about the measures to boost the offer to joining ratio and giving goodies to welcome new joinees on – board works. If you’ve been searching for ideas then you’re in the right place. Many organisations have implemented several measures to ensure that the hire’s joined and remain with the organisation. But how many of us have wondered about the fruits of our efforts? If you’re wondering how “Joining Goodies” impacts ‘New Joinees’ or simply searching for ideas to improve the offer to joining ratio then you’re not going to be disappointed. And if you’ve come this far and are reading this then we’re sure that you’ll definitely get the assistance you need as we’ll be highlighting the key takeaways shortly. Creating a good experience starts with first impressions via connecting with the candidate prior to interview scheduling. Distributing pens, Bags, t-shirts, identity cards etc. with the Company’s Logo create a good impression about the company. Distributing accessories with the Company’s logo builds the brand name via ‘Word of Mouth’ a traditional marketing technique. Giving Free Gift Hampers containing the organisations products to joinees in the consumer products segment or other segments creates a real brand image publically and avoids restricting it to only joinees alone. Candidates experience the ‘Employer Touch’ with “Joining Goodies” hence it’s the best practice for the organization to follow. Experiences matter much more than the “Token Goodies” as it helps employees to bond with the company better than “Goodies” so get them to attend a session where your products / services impact the target market audience. Creating placards with a New Joinees name and using them to announce their names is a good option. “Joining Goodies” helps them to understand the company culture and gets them to consider themselves as a part of the Company from the joining date. When Employees utilise the company branded accessories they feel proud and don’t mind carrying the logo with them. With company branded accessories they get to talk about them among their family and friends and is a big achievement Employer and Employee Branding is concerned. Create a good experience by giving New Joinees the “Goodies Kit” as it makes them feel happy irrespective of their performance in the interview. It is essential to create a good Candidate experience at the interview stage especially to rejected or unhappy Job Aspirants since this affects branding. When targeting the right Talent for the position one needs to realise that some of them could be ‘potential customers’ or ‘consumers or ‘influencers’ hence giving “Joining Goodies Kit” helps. Impact of “Exit Goodies” is more profound on Branding than “Joining Goodies” hence the rejection stage is important and requires just as much attention. Distributing Goodies builds a relationship, branding and helps spread the word within high competitive environments. Get ‘company branded pens or personalised pens, bags, t-shirts, etc.’ made and distribute them as “Joining Goodies”. Spare 10 minutes and request the New Joinees on the ‘Induction Day’ to follow the Company Brand Online via Twitter, LinkedIn, and Facebook etc. but before handing over the “Goodies Kit” and add a smart tag ‘Thank you for Joining’. Organisation can also give away “Joining Goodies” to senior level hiring and / or arrange lunch meetings for Senior Folks. Attending a session where the product / service you’re working for impacts the target market. Organisations can welcome new joinees with a placard announcing the name of a new joinee. Companies can send ‘Cabs’ to New Joiners or only for Outsider New Joiners on the first day as it will help them to adjust to a new place. The “Joining Goodies Kit” can include a complete employee’s handbook, basic stationary, HR and other key persons contact details, lunch, company t – shirt and a good welcome note. Similarly, firms can host a ‘Welcome Party’ for the New Senior professionals joining especially CXOs on the day of joining or the first weekend providing them with a chance to get to know the Senior Management Team. Organisations can gift New Joinees free Bags & Shoes of any price of reputed brands or even a keychain and wrist band can work. Give ‘Free Gift Hampers’ containing the organisations products to joinees within the consumer products segment and other segments and / or to all interviewees. Firms can host a ‘Farewell Party’ for Senior Professionals joining other firms especially CXOs on the day of their joining or the first weekend for a chance to interact with all the Senior Management Team. Irrespective of whether a Candidate’s resume is shortlisted for an interview companies can send ‘$5 Starbucks Gift Cards’. The above pointers clearly sums up the discussion that after reviewing we found to be quite enlightening and interesting. We’re sure that if you’ve come here looking for ideas for “Joining Goodies” you’d have got plenty. And even if you’ve wondered what relevance, importance and impact can distributing “Goodies” have in the Talent Acquisition sphere you’d have got all the information you need. Having, said that if you’re not already a part of these discussions then you have no idea what you’re missing out on. So follow us @SourcingADDA to get real time updates to our upcoming events and activities. Be sure to leave your views or request’s to join these WhatsApp groups in the comments section as we’d be glad to add you to these groups. If you’re having trouble with the joining ratio at your company then these simple questions within the conversation above can make all the difference. So let’s get right down to the key take a ways that will assist you when you find yourself in the same situation. How to identify if a Candidate will surely join? If a candidate is ready to compromise on their current notice period, the probability of them joining is much higher. Meeting Candidates in person gives you an opportunity to identify the joining probability through body language and through observing indicators. How is your Manager reacting to your Career move? Ask for an immediate Resignation email post sending the offer letter but with the HR head in CC; this can be a deciding factor. Post the offer after asking for the immediate resignation email if a Candidate does not send it within 2-3 days then the probability of joining is low. Check the Candidate’s résumé on the portal and check when it was last updated, if it is frequent then make a dummy call to the candidate to check if they are considering your company as an option or not. Ask the candidate how they are taking the opportunity i.e. is it just another job move? (The reason would prove whether or not the Applicant is really interested in the opportunity and if they’ll join or not. Just asking question/s won’t give you the exact picture of what’s going on in a candidates mind and there’s no science for that. Pre Offer and Post Offer behaviour, Pro-active communication and co – operation during different stages of hiring would indicate how keen the Candidate is to join. To get an assurance from the applicant of joining you need to check their past tenure background and the reason/s for leaving. If the candidate give you a copy of the salary slips after verifying them with the original then that improves the joining ratio and states that they are trustworthy. When dicey about the candidate joining, it is imperative that active communication is maintained religiously. How to boost the joining ratio? Keep the Candidates engaged by inviting them over for lunch or coffee as you’ll get a sense of whether they’ll join or not; it is preferable to encourage the line managers to do so due to a better impact. Share company achievement updates or a monthly company magazine with candidates to maintain their interest. You can invite the applicants to events such as a company Annual party, Achievement party etc. It’s vital to keep the candidate happy and engaged right from the offer stage to the point at which they start and become a fully-fledged employee and the whole process counts. Employer branding can impact their decision especially if it is strong and genuinely reflects the reasons that someone would want to join in the first place. The entire hiring process must be easy for the candidate to go through and is essential for them to feel that the company is well organised and efficient. Any other approach will sow seeds of doubt and the candidate will be easily swayed into looking elsewhere. Realise that the new hire wants to start building the relationship with the new boss. Send them their business cards, create their corporate emailing signature and identity cards with their name and new job title next to the company logo create a really powerful image. Distribute ‘Joining Goodies’ such as a t – shirt, notebooks, even those strange squeezable stress balls are a good idea especially if they have young children which can get the family excited about the new job. Once the Candidate accepts the offer it’s essential for the TA team to be in touch with them for any reason. Try and understand the personal ambitions, situations, family etc. if they open up immediately after the interview or outside the office premises. Well the points mentioned above portray a fair, clear and chirp picture about what Talent Acquisitionist’s like yourselves can do to ensure that a selected candidate joins. We’ve even given ideas on how to boost the joining ratio and solutions to help you achieve your KRA’s. If you’ve found this enlightening and have added to your knowledge you might want to follow us @SourcingAdda and no doubt would like to join in these discussions. If yes, then do leave us your views and request’s to be added in to our WhatsApp groups in the comments section. We’ll be really glad to add you since we’re in constant search for new perspectives and would like to hear yours as well. Talent Acquisitionists are constantly required to Source Talent to fill vacancies and there are various tools and methods to achieve this. Several organisations are slowly incorporating these new methods and techniques to evaluate and shortlist candidates to capture the right fit. It is important for organisations to hire the right Talent for the right profile and within the given time frame. Hiring should be time bound but proactive; unless one is hiring readily available candidates instead of the most suitable candidates. The quality of hire will increase only if the organisation is ready to invest in the process in a timely manner. Stay invested in passive candidates for future roles else you’ll have a Hire Fire type of engagement that can affect them as being possible candidates in the future. Many organisations utilise the TAT for candidate selection although it helps to shortlist candidates it rules out the ones that don’t meet the criteria. 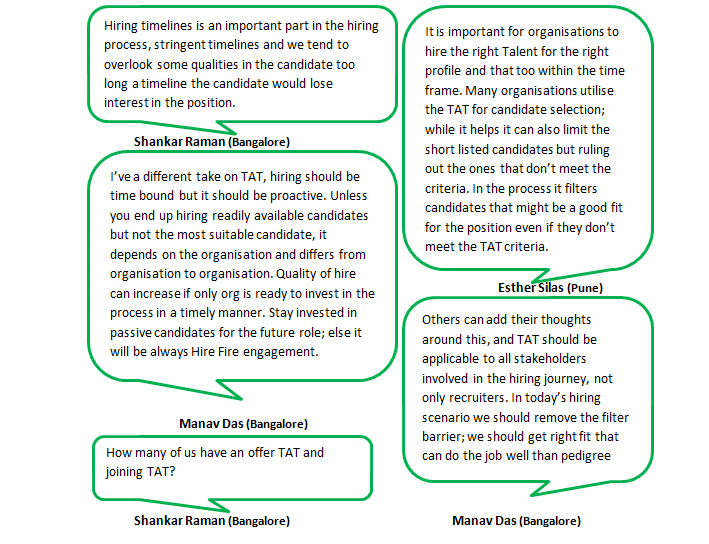 In the process it filters candidates that might be a good fit for the position even if they don’t meet the TAT criteria. Depending on the organisation’s hiring process followed one can also conduct an offer and joining TAT to filter the Candidates further if required. In today’s hiring scenario we need to remove the filter barrier and capture the right fit Talent with the calibre and capability to perform the tasks well. Well there you have it all the aspects that play an important role in the growth of the organisation and the implications of having unreasonable Hiring Timelines and TAT selection of candidates. Whether you’re new to these techniques and selection tools and / or are looking to formulate your own selection processes then these inputs will be helpful nonetheless. Having said that; if you’d like to be an active participant instead of a passive one then ensure that you leave us your views and or requests to join these WhatsApp groups in our comments section. In the meantime make sure you follow us @SourcingAdda to get real time updates to our upcoming events and activities. 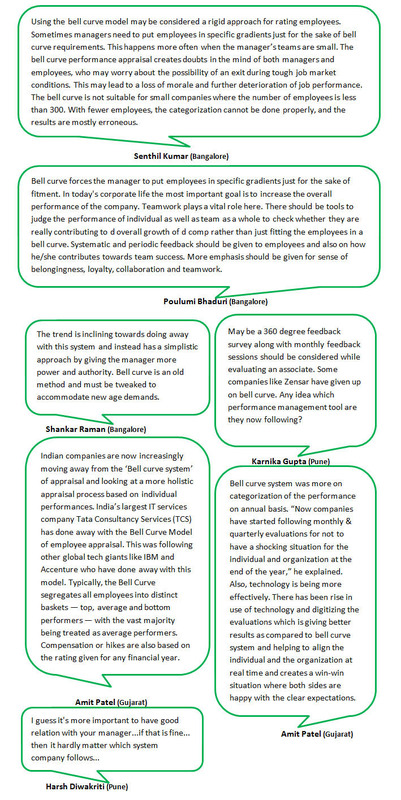 WhatsApp Group Chat – Bell Curve Performance Management System a boon or bane? Most IT companies have several Projects & deliveries to cater to and it need not be that each project will have people to fit in the bell curve. Well this brings us to the end of an insightful and enlightening experience that we’re constantly on the look – out for, isn’t this great? You can gain different perspectives, add to your learning while staying updated with the current trends followed; live at our popular Wednesday discussions. Want to get these perspectives and more in real – time then you absolutely need to join these insightful conversations. You can do this by following us @SourcingAdda; hence, leave your views or requests to be added to the various WhatsApp groups in our comments section.